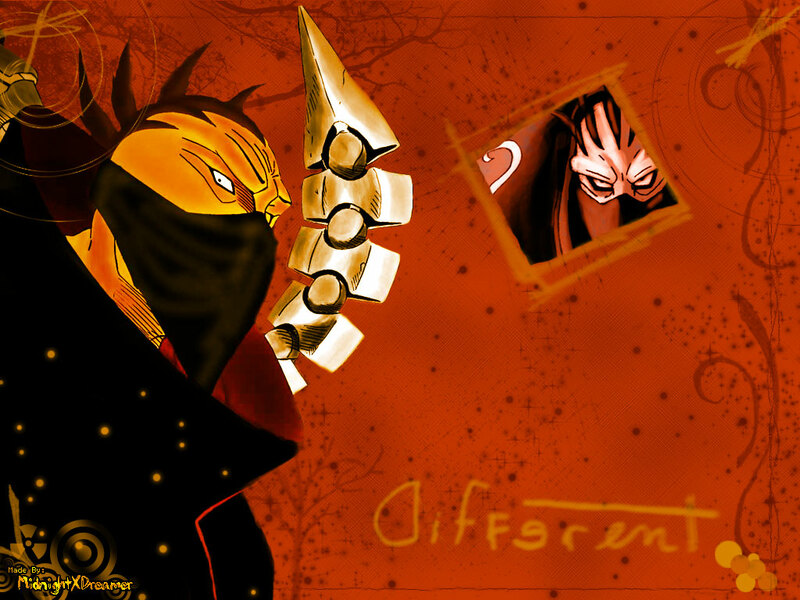 This wallpaper is from the anime called Naruto. This one is supposed to be Sasori, but he's currently in his Haruko puppet form. I chose this since I had this image lying around in my folder so I just used it. I used a plain dark orange background since I thought it kind of matches his puppet form. I placed Sasori on the left side since it looked better there than the right. Then, I looked for another image and I placed it on the upper right hand corner. I did it like a picture form of Haruko by erasing the unecessary part of the image. I just used many different kinds of brushes in order to enchance this wallpaper. I thought it was pretty good when I finished it. As for the title, I used the word "Different" from the Doodle brush since I thought Sasori was a type of different person in Naruto since he's a living puppet. nice wallpaper. :) thanks for sharing it here. First one of this kind for him.